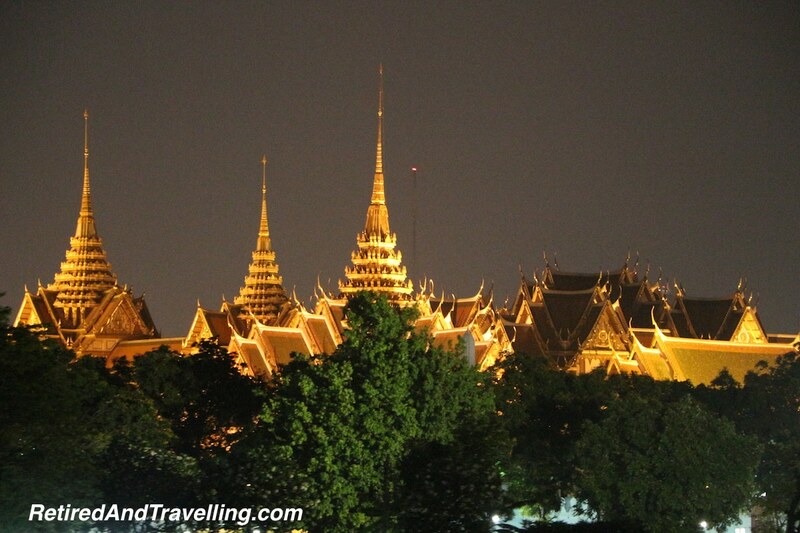 We were in Bangkok for a few days. 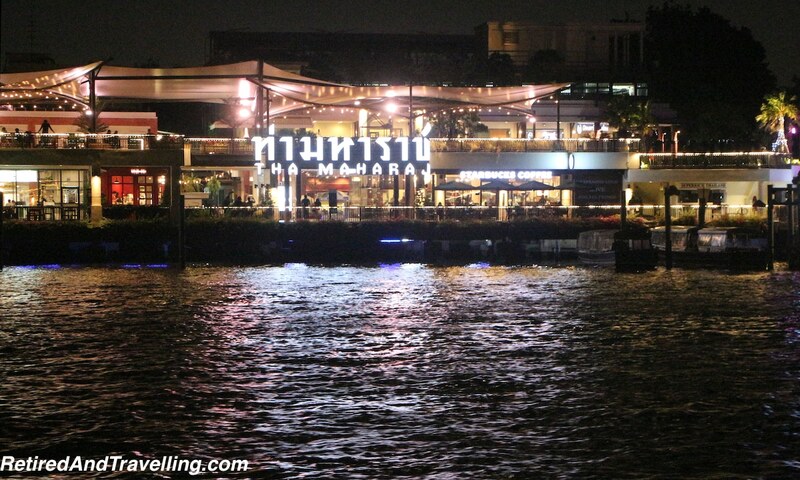 One of the things on my list of things to do was a river cruise. Many of the large tourist sites are close to the river and a river view will provide a different perspective. 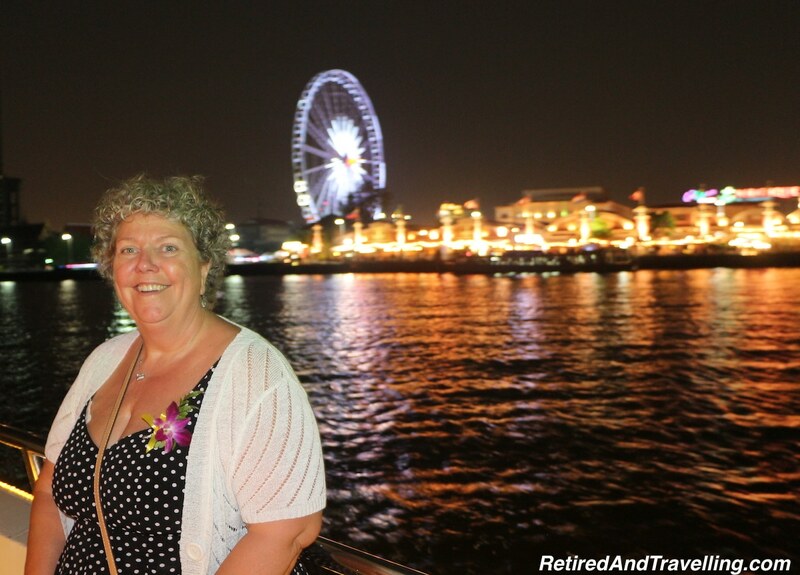 After researching cruise options, we felt that a night river cruise might be even more magical. 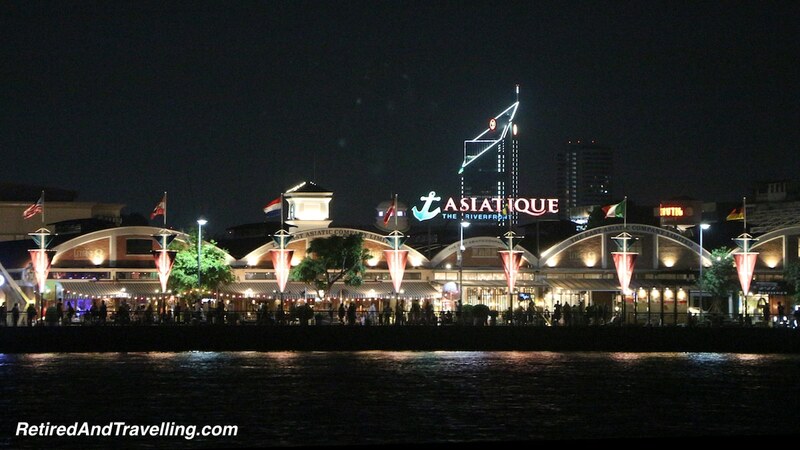 This would be our choice for Bangkok by night. It was too bad we had not read the reviews first! I looked at a few companies online and then we asked our hotel for recommendation. Since we were enjoying Executive Club service, I had hoped that the tour choice would have been thoroughly vetted. But I was wrong. 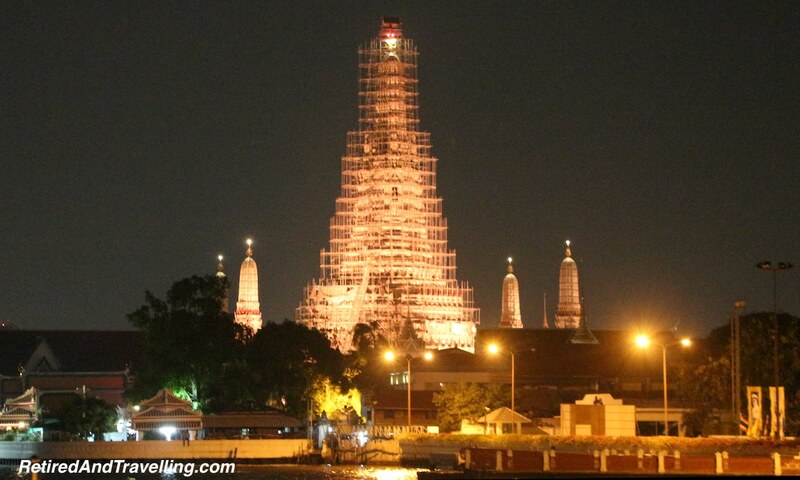 The Grand Chaophraya tour proved to be a major disappointment on all fronts! The concierge booked our tickets for pickup. We grabbed a taxi to River City and wandered around until we finally found the ticket office. 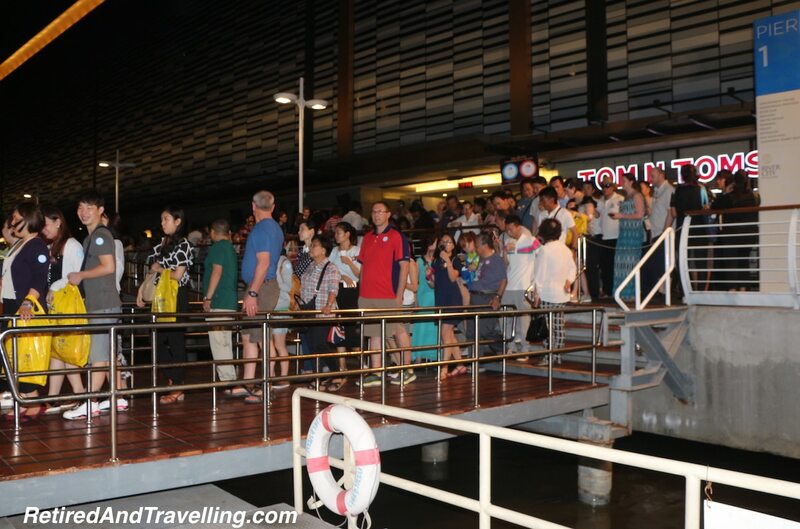 River City had a steady procession of different boats dock to pick up passengers for different night river tours. 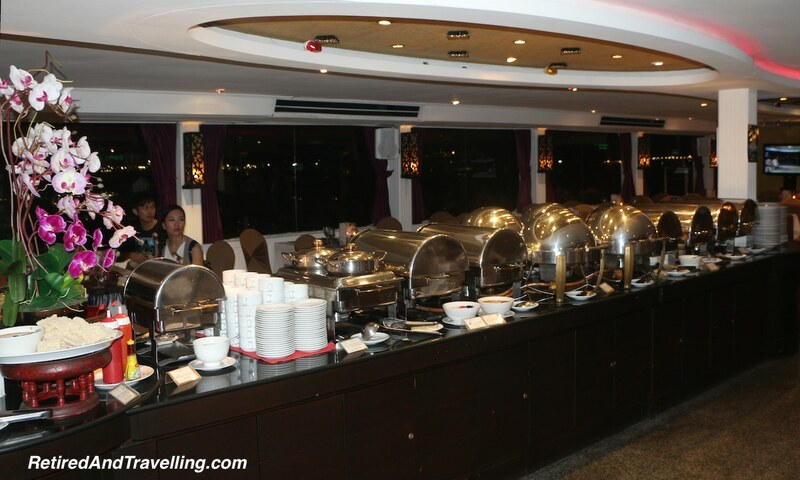 Some boats were small, intimate experiences with dining tables at the windows. 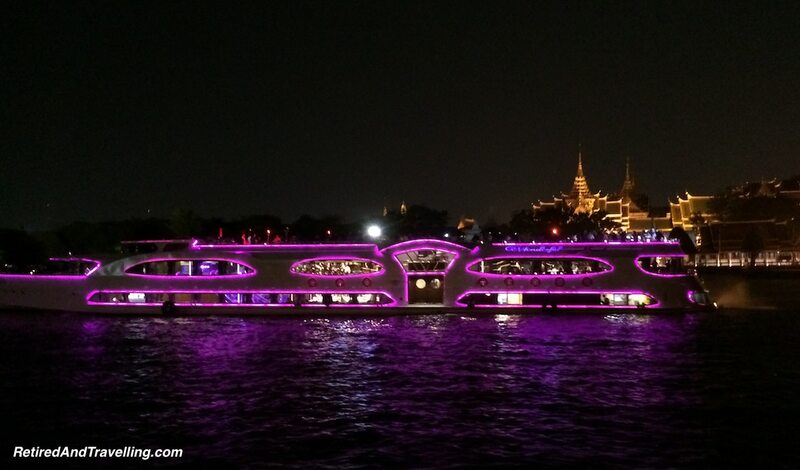 We knew that the boats bedecked with brightly flashing neon signs were more likely to be party boats. While we waited for our boat, the reception staff floated around the dock welcoming the guests with flowers and the obligatory “free” photo. Thinking we had booked a smaller boat, we were surprised by the large boat that pulled up. Two levels were jammed with tables. 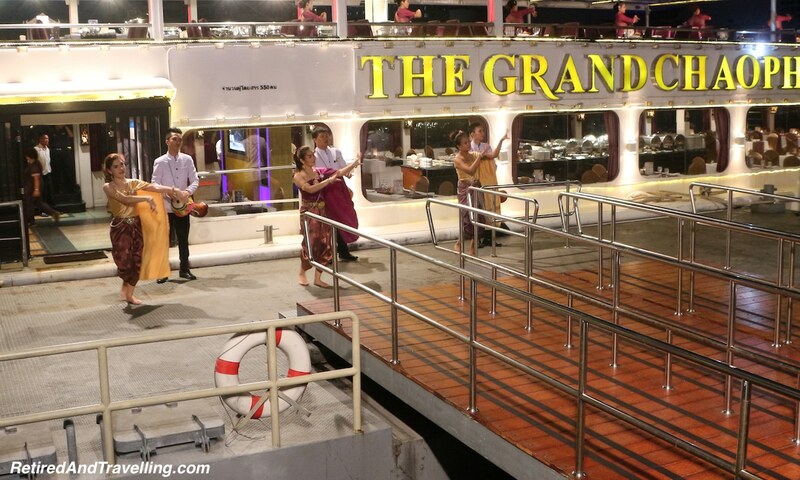 As the boat docked, the crew provided a short Thai song and dance routine. 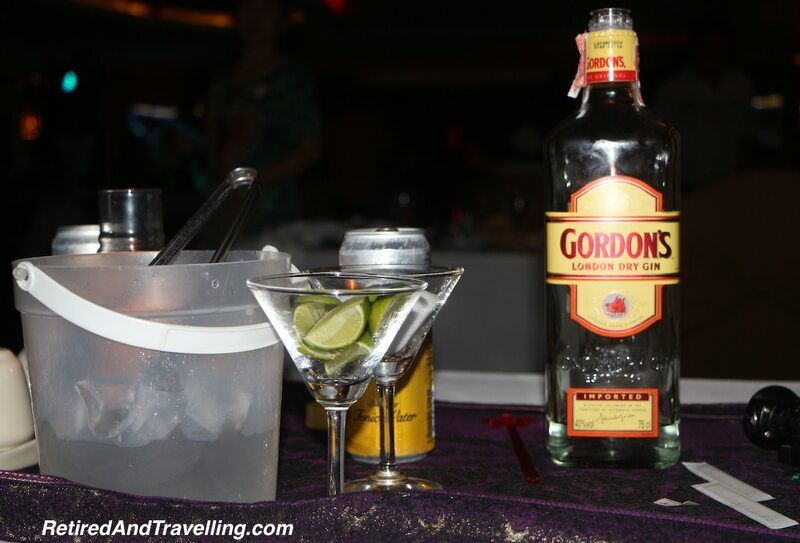 Unfortunately this was almost the last authentic Thai experience we would get on this cruise. The gates opened as the long lines of people were directed to their assigned seats. 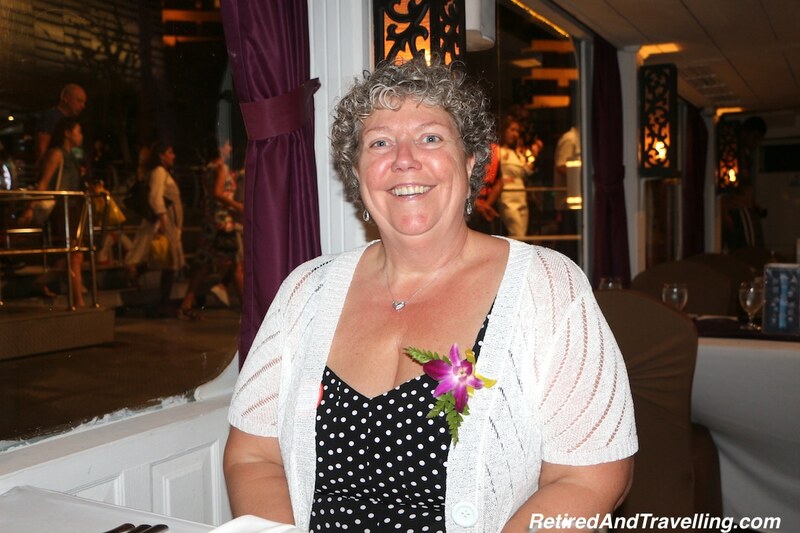 It was clear that nobody was worried about a dress code on this cruise. We did not get a choice of seats when we booked. Finding our spot, we were not sure if we were pleased or not to be seated inside the air conditioned lower level at a window. While we may be comfortable during sailing, there would be no real opportunity for pictures unless we left our table and went upstairs on the outside deck. With everybody loaded, the boat took off towards the major sites at what felt like a breakneck speed. Not once did we get any commentary about the sites we were racing past. There was not even an announcement when there was a site beside the boat. David finally abandoned his dinner to spend most of the time on deck trying to catch a good picture. Kind of hard to get great pictures with the boat moving as fast as it was in pitch dark. Even the most skilled photographer might be challenged to catch a crisp image! But David had come prepared with his monopod and good DSLR camera. We knew that the snapshots most people were getting with their phones would pale in comparison. I was surprised when I reviewed our photos the next day and found that we got some good ones. 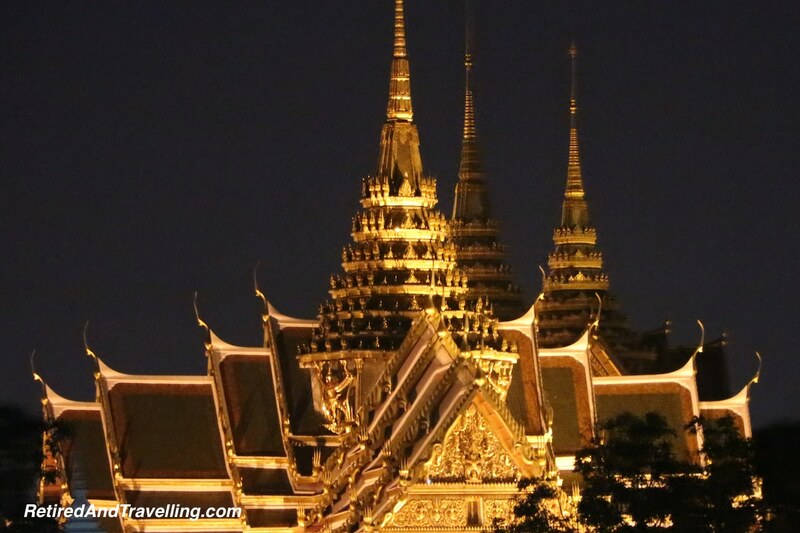 It was a preview tease of the temples of Bangkok we would see the next day. 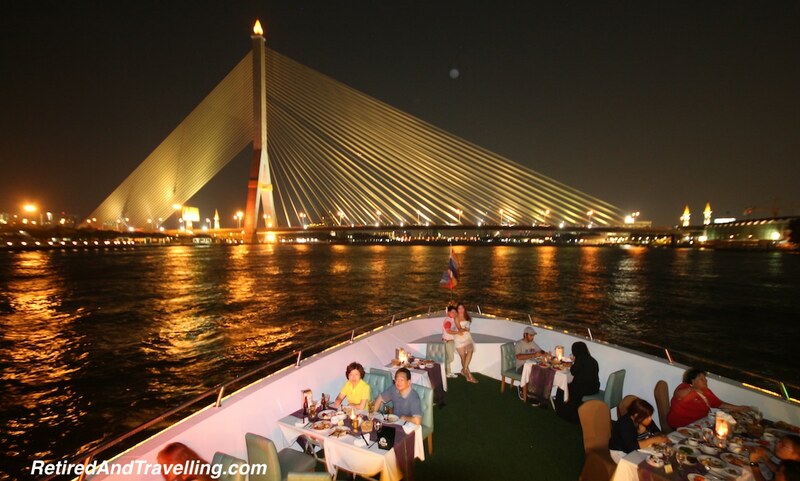 I was certainly disappointed after having seen all the great night river cruise pictures online. 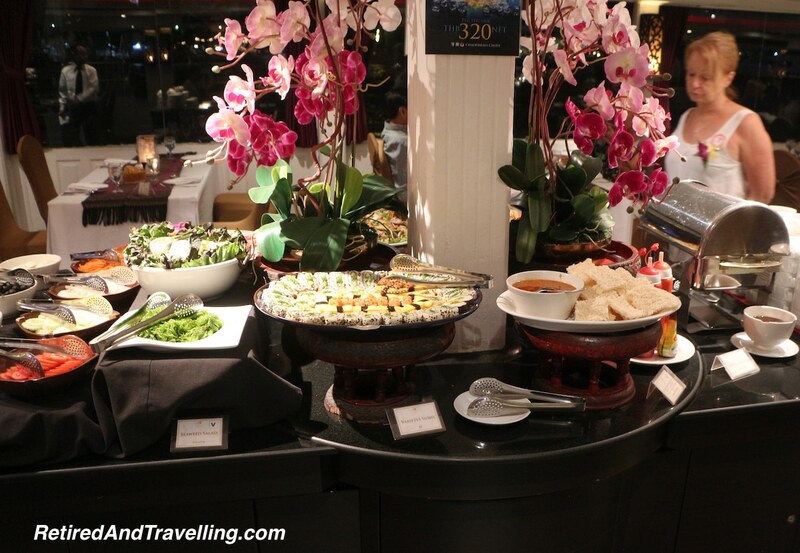 At first glance, the buffet table was well stocked with a good variety. The food had barely been arranged before the crowds lined up to fill their plates. David was not that unhappy to have missed most of the dinner. 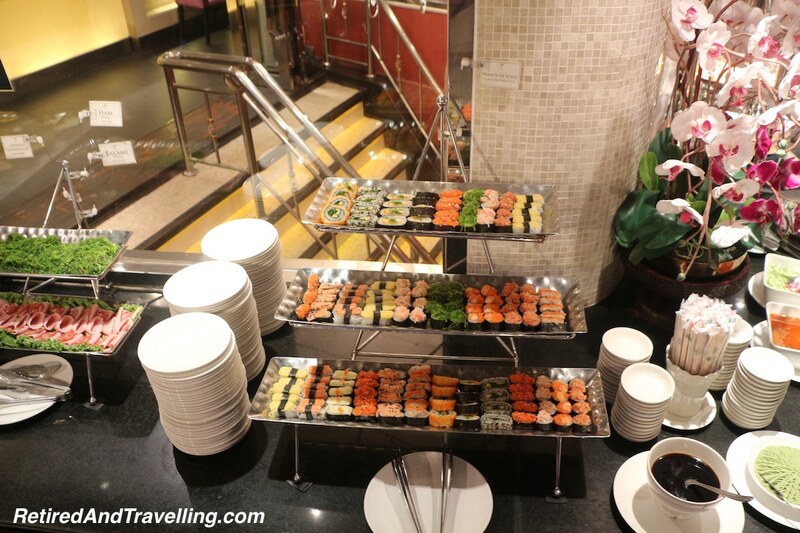 The buffet food that should be hot was cold. Things like sushi that should be cold, wilted at room temperatures over the night. There was no hot steaming fresh Thai food. I guess we had been spoiled by the fresh hot street food in Bangkok. We ate our fill but when we got sick the next day, we did not really wonder at the source of our travellers belly. Unfortunately being sick would hinder some of our adventure opportunities in Thailand when we headed to Krabi next. And we would not be enjoying as much great Thai food as we had hoped! Water was free but everything else you had to buy. 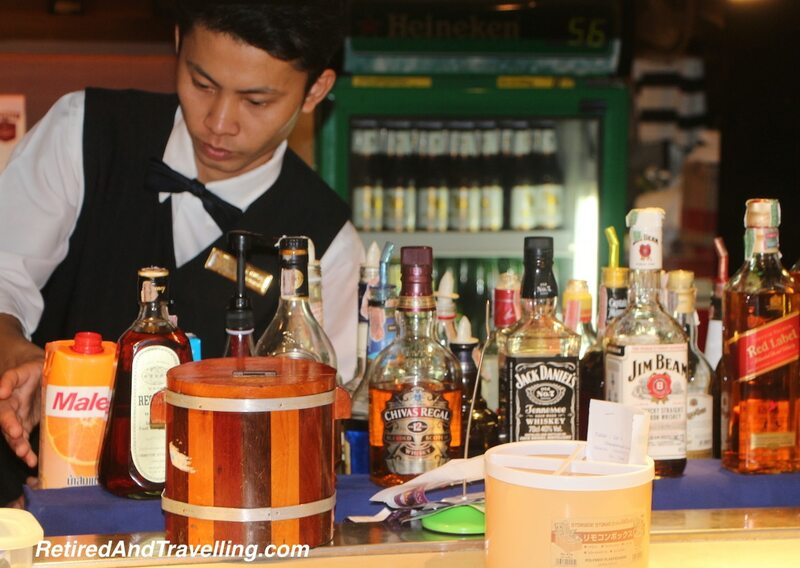 The bar was well stocked at typically high tourist prices. The people at the next table appeared to be trying to drown their sorrows over the pitiful trip. They downed a full bottle of gin over the 2 hour journey. 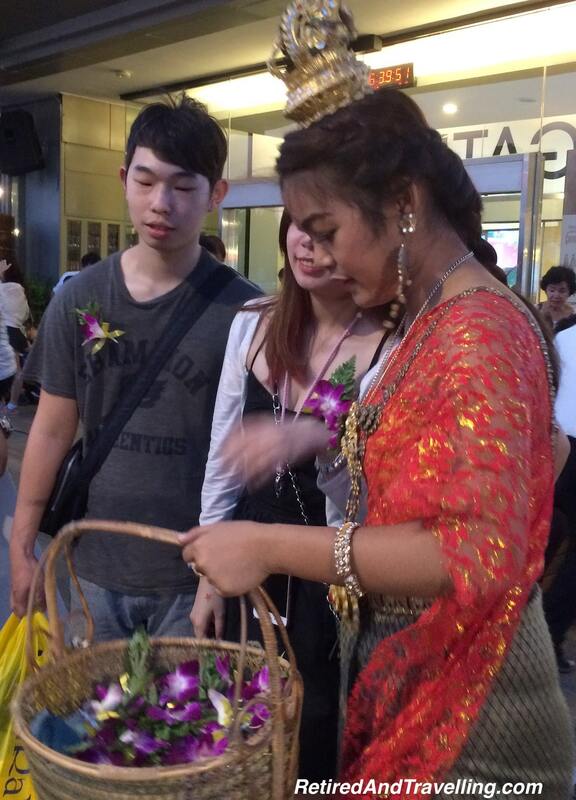 The brochure said we would be entertained in Thai fashion. 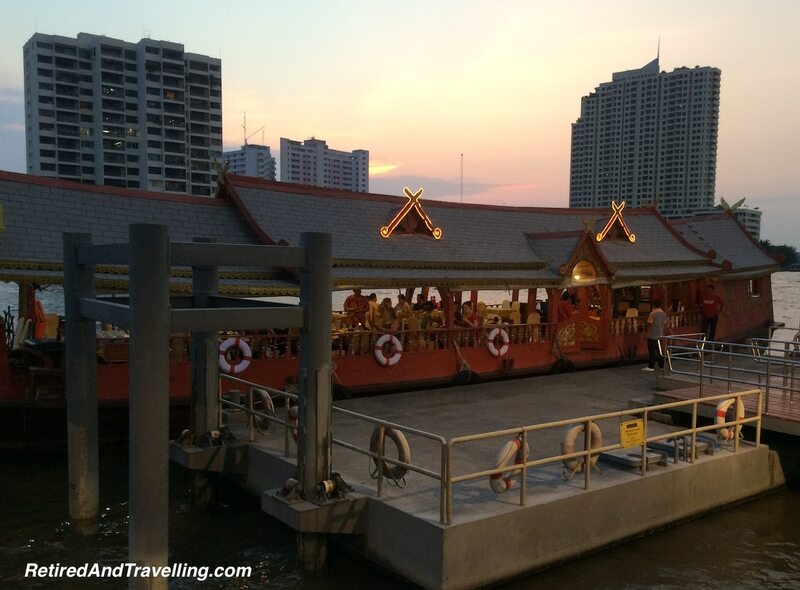 There were a few Thai sounds when we first entered the ship. Then the rest of the entertainment on both decks was badly sung popular music. 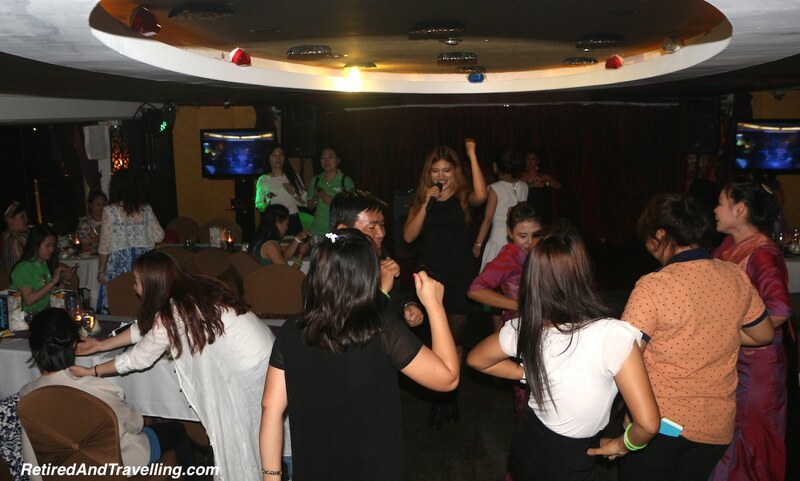 Nobody could really claim that “Gangnam Style”, “YMCA” or Frank Sinatra were Thai music. 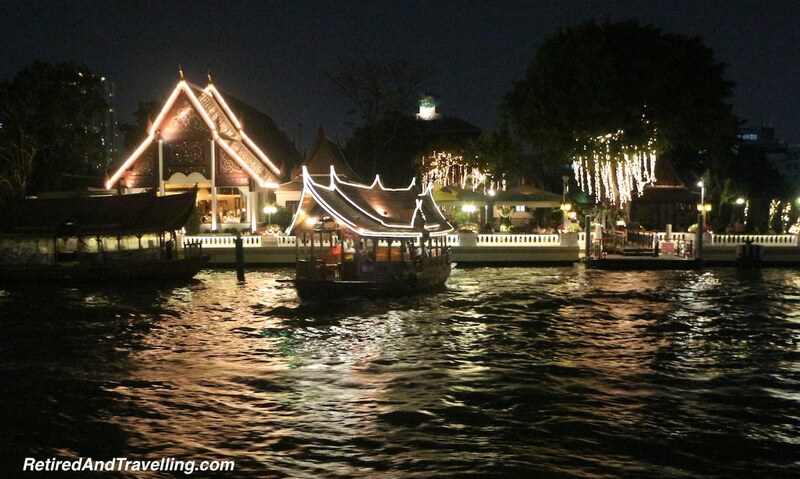 Should You Try A Night River Tour in Bangkok? 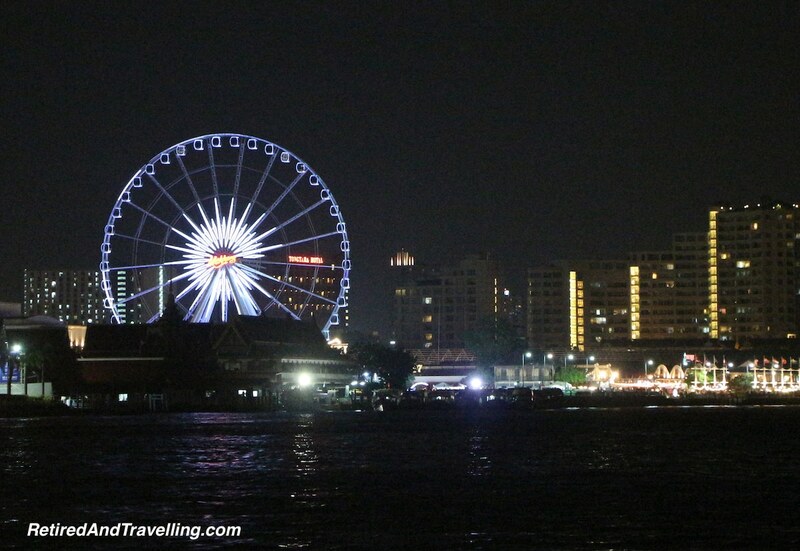 We did manage to find a section of the upper deck to watch some of Bangkok by night. But it certainly was not the romantic cruise we might have had. 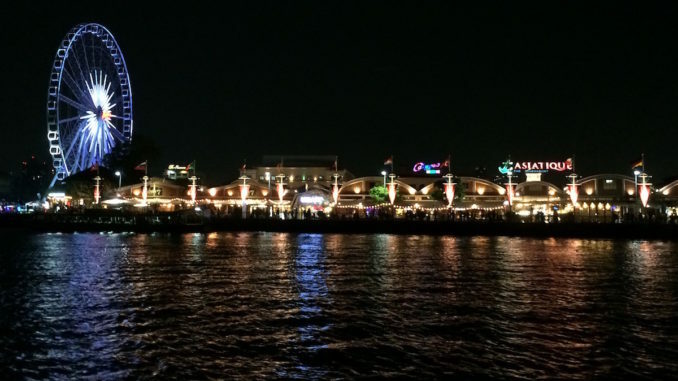 Nor was it the educational discovery of Bangkok by night that we had hoped to get. If you love buffets, have an iron stomach or want to just dance to modern music, then maybe this cruise would be for you. Probably the most exciting part of our experience that night was the tuk tuk ride back to the hotel. It was our first tuk tuk adventure and our driver did his best to weave and race through the night traffic to keep our hearts racing. 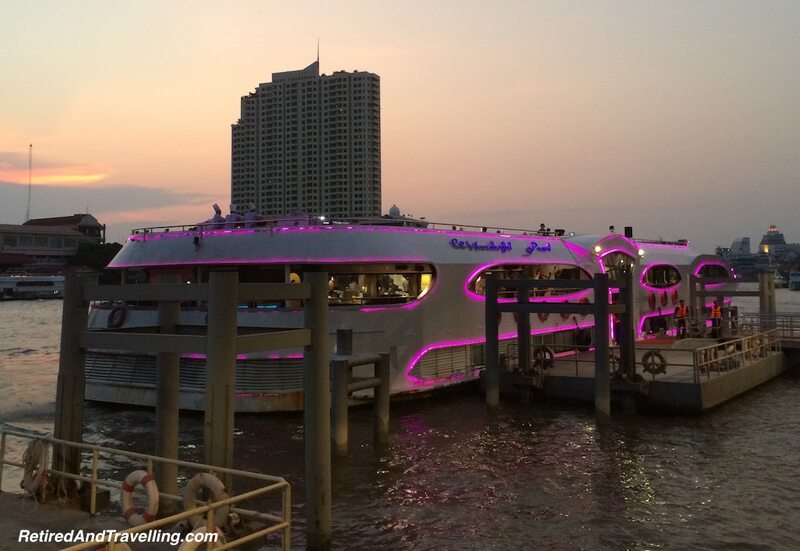 If you book a river cruise to enjoy Bangkok by night, do your research thoroughly and read the reviews. Don’t always trust the recommendation of the concierge. Know what you are looking for and weed out the dozens of night river cruises that might leave you disappointed. 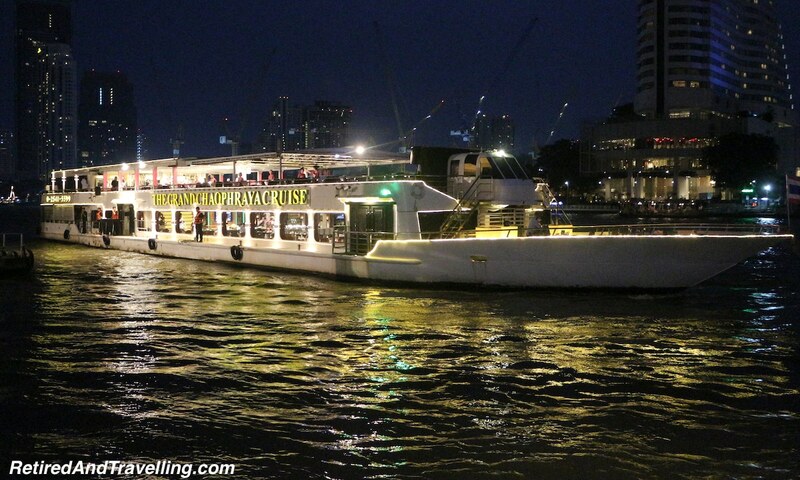 Did you do a river cruise of Bangkok by night? 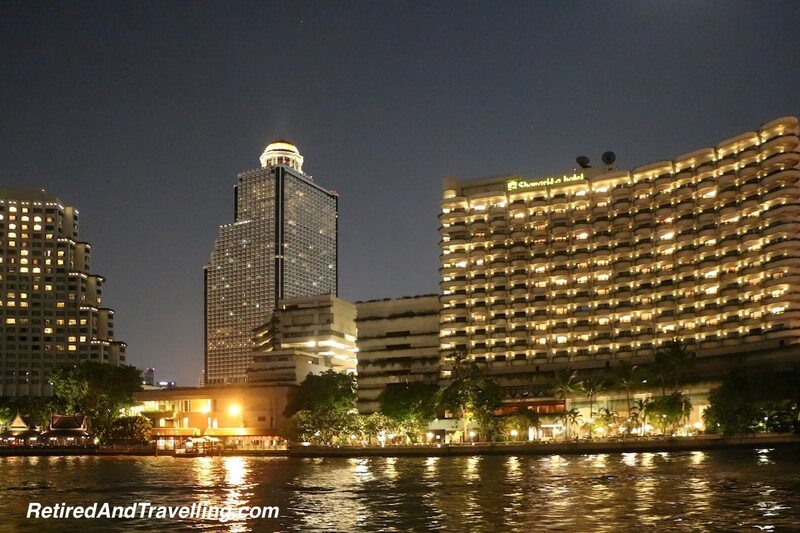 Did you find something better to enjoy Bangkok by night?